Do raster images that are imported stay as raster images when ready to print or do they become vector images when placed into the document? They stay as raster. If they have vector clipping that will be kept as vector if possible. They may become bitmap fills rather than images or raster layers. We don't try to fit curves to the pixel data and then replace the pixel data with the curves. Thankyou Dave. But maybe you could elaborate because I have seen this written elsewhere on the forum, that word: Bitmap Fill. My understanding for years is that a raster image IS a bitmap image. Yet on the forum I have come across these terms as if they are mutually exclusive by definition? On these forums it seems that "bitmap image" is often used to mean a file with a 1-bit per pixel format. Such a file would support two colors, e.g. black (0) or white (1). The Affinity applications don't support that format file. The closest they support is a grayscale 8-bit per pixel image where each pixel has one of two values (e.g. each pixel is either black (0) or white (255)). Such a file would look identical on the screen to a file with only 1-bit per pixel, but would behave differently for some usages or applications. I'm not sure what Dave meant by "bitmap fills". Yes, images, bitmaps, and raster are all the same kind of concept, and different to vector. A bitmap fill is an image that is used to as the fill, eg for a shape. I just meant that since it is a filled shape, it is a different kind of object in the Layers panel to an image object or a raster layer. Ok I need to clear this up once and for all. Affinity Pub deals with ALL imported photographic raster images as raster images regardless of how they are placed, whether by the picture frame tool, the image tool or directly through place from your document folder. Because when you use terms like raster layer and image layer to a photographer the latter is meaningless. And even back in posts from 2016 the term image layer, pixel layer and raster layer were used as if they are distinct and separate concepts. Surely there are only ever two concepts, Pixel or vector, the former always known as raster. So when I keep reading pixel layer, image layer, picture frame, rasterize; it does get bewildering for me when I have only ever in all these years dealt with just two concepts both in IDD, Illustrator, and photoshop. 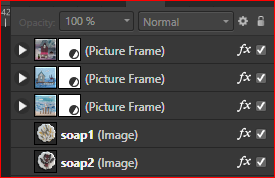 While we are on that subject, I assume that in this example layers palette, picture frame means imported by using picture frame and image means imported by using a simple place from the drop down menu. Apart from the method ofimport there is absolutely no difference at all between the two. The confusion comes form the two "types" of raster layers we have in the program. You can identify the type of layer looking at the table between parenthesis after the layer's name in the Layers panel. The types are pixel layers and image layers. Image layers are a "special" layer type that retains all the original image data - you can think of them as embedded images -. They are created when you use the Place Image Tool (in Affinity Designer and Publisher only), the File ▸ Place command or when you simply drag them from the Finder (Mac) or File Explorer (Windows) to the canvas of an opened document. They can be transformed globally (rotated, skewed etc) without losing quality but they cannot be edited/manipulated at a pixel level. For that the﻿y must be rasterised first. To do it right-click on them in the Layers panel and select Rasterise. They are then converted to a pixel layer type which you can then manipulate at a pixel level. Image layers are rasterised using the DPI value set in the Document Setup dialog. If you then decide to place them inside a picture frame (no matter the type of layer), use a shape to clip them or whatever functionality you may think of that's up to you. Yes, there are two basic types, raster and vector, and Publisher always treats them as such. I'm not sure what else you think it might be doing. Seriously, what is it that you are worried about here? In Publisher there are many different kinds of object. Some are vector and some are raster. For example, vector objects include shapes, curves and text. Similarly raster objects include placed images, raster layers and picture frames. Also, vector objects can be filled with raster, and raster objects can be clipped by vectors, so there can be hybrid things going on. Publisher is a rich, complex program but it does all come down to vector and raster in the end. The different kinds of object have different properties - for example, a picture frame object has some extra scaling logic that a simple image object doesn't have. MEB mentioned some differences between raster layers and images. Hallo Dave and MEB, well finally, MEB has answered what has been for me (and no doubt many others) a somewhat bewildering topic about how AfPub is treating images depending upon how they are imported, What MEB said about the two tools used for bringing images into AfPub has cleared up a whole lot and now I understand how best to organise my workflow in this context. I personally think that MEB's comments should be added to the help menu in AfPub's help section. This point that he made : without losing quality but they cannot be edited/manipulated at a pixel level. For that the﻿y must be rasterised first : has cleared up everything. And this point : The confusion comes form the two "types" of raster layers we have in the program : is also good to understand. This makes things so much clearer now. Thankyou MEB. Seriously, what is it that you are worried about here? It is more of a case of fully understanding exactly how AfPub has organised itself. Knowing the engine so to speak helps prevent problems and aids to solving issues. They are then converted to a pixel layer type which you can then manipulate at a pixel level. Can you give examples of what this means in Publisher? If can apply nondestructive Effects and Adjustments to an Image layer why would I want to rasterize it? I'm just getting started with Publisher after 25 years of using QXP and InDesign so this is all new to me. If you don't need to edit the images at a pixel level (for example cloning things, inpainting etc) in Publisher (and usually you don't - most of the time you already have the images ready/prepared or just need some minor/global adjustments) you don't have to (neither should) convert them to pixel layers. As you noticed you can apply non-destructive adjustments/filters/effects to them so keep them as Image layers. Thanks for the reply. I guess my confusion was about the integration of Publisher with your other products. So you're saying that things like the Clone tool from Affinity Photo would be available inside Publisher to retouch photos in the context of the page layout? If so, that's very cool.